Antonio Conte insists Chelsea are working hard to sign players. Will that only be at the last minute? 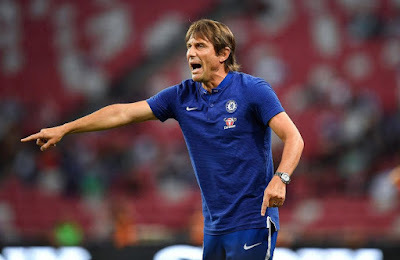 Antonio Conte has re-iterated that Chelsea must sign three or four more players to strengthen the squad ahead of the new season. Reports state that Chelsea are reluctant until they see how things play out in the first few games of the season. It's become clear that Nemanja Matic was sold by Chelsea against the wishes of Antonio Conte. Speaking openly yesterday at the launch of the new Premier League season and having made it clear ahead of the Community Shield when asked about his move to Manchester United in his press conference, Conte cuts a frustrated figure. To be continuously asked of Diego Costa repeatedly in every single press conference or interview isn't doing anything to improve his mood at the moment either! As we have all seen over the summer, as with every year to be honest, Chelsea have been linked with a whole host of names, some exciting and some that we feel that we shouldn't even bother with to be fair. The four signings we have made are good signings and apart from Willy Caballero (I am beginning to change my opinion of him in a good way) all will push for a regular start in our first team which is exactly what we want. However, everyone from the Manager, Gary Cahill as our new Captain and the supporters realise that if we want to make a realistic challenge for honours once again domestically in addition to a challenge for the Champions League this year (check out the latest sports betting tips ) then we have to add more quality to the squad. At the moment Chelsea are being linked with the likes of Danny Rose, Ryan Bertrand, Sergi Roberto, Alex Oxlade-Chamberlain, Danny Drinkwater, Ross Barkley and Fernando Llorente and without question even more players will appear in the press as targets for the Blues ahead of the window closing at the end of the month. It's who we eventually sign to appease Conte that is the most intriguing and when that will happen. I am as frustrated at the club as the next person because as Champions we should be dominating the transfer market as we did three years ago and move early to get our main targets signed. Diego Costa, Cesc Fabregas and Felipe Luis were all signed within a couple of weeks of the season ending and took everyone by surprise. We have seen no repeat of that summer with the club changing their approach to the market which has cost us a signing or three over the last two seasons. According to a report quoted in one of the mainstream media outlets, the reasoning behind a lack of movement in the last couple of weeks when it seems obvious to all of us that we need players ASAP is that there is a reluctance to move for players at extortionate fees when our first team, when everyone is fit and available, remains up there with the best in the Premier League. Last season seems to have set a precedent as Conte very rarely would deviate from his trusted and preferred first team week in, week out. However, more games including European football will no doubt take its toll. There will be injuries and suspensions and we have to have quality replacements to step straight in to ensure that the manager still has what he has always spoken of being the perfect balance to his team. The fact that Antonio Conte has taken every opportunity with his interviews broadcast on television to speak of a requirement for Chelsea to bring in the players he desperately needs speaks volumes. I trust in Conte and I trust in Roman Abramovich 100% and see no reason to panic just yet because Roman has never let us down before. I have faith in our club to give Antonio Conte the signings he wants ahead of the transfer window closing but it looks like we will have to wait right up to the last minute this time around. There is a saying in football - "You cannot win the Premier League in the first ten games of the season but you can lose it!" Come on Chelsea act sooner rather than later!